On December 5th, 2016, I got a chance to present the PEACH Reality project I've been working on to Steve Guggenheimer, who is (at the time of writing) the Corporate Vice President & Chief Evangelist at Microsoft. 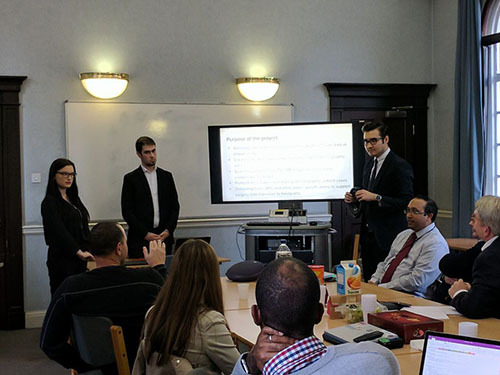 The presentation itself lasted around 15 minutes during which my team had a chance to describe the purpose of the project, expected outcomes and deliverables and, finally, show the prototype of our app in action. The video we've shown to Steve can be found here and the slides (for those interested) can be seen here. Sadly the quality isn't as good as I'd want it to be but we've been given very short notice about this presentation and it turned out quite well in the end. The picture below was taken by Mirek Janatka, who's currently doing his PhD in Surgical Robotic Vision in UCL and is supervising our project. Steve Guggenheimer can be seen sitting on the left and I'm the one holding HoloLens right in front of the screen.